For Aqua line Extension, Noida's share is around Rs 130 crore, while Greater Noida’s share is around Rs 250 crore. The Centre and the state government will also contribute by providing Rs 360 crore each. In addition to this, the government is also likely to take a loan of around Rs 1,200 crore for the project. Noida, Metro Rail News: The Construction of the Rs 2,600-crore Aqua Line extension project towards Greater Noida to be taken up in 2 phase. With both the Noida and Greater Noida authorities citing funds crunch as a reason for being unable to contribute their share in the project, the construction of Aqua Line extension, expected to cost Rs 2,600 crore, is likely to be taken up in phases. At an upcoming board meeting in December, the Greater Noida Industrial Development Authority (GNIDA) officials are likely to suggest that the construction of five metro stations on the extended line (two in Noida and three in Greater Noida) to be taken up first, states a ToI report. However, it will need the backing of the Noida Authority as well as an approval from the Uttar Pradesh state government for any such construction work to start on the route. For the entire project, Noida’s share is around Rs 130 crore, while Greater Noida’s share is around Rs 250 crore. The Centre, as well as the state government, will also contribute for the project by providing Rs 360 crore each. In addition to this, the government is also likely to take a loan of around Rs 1,200 crore for the project. As per the original DPR, the extended line of Noida Metro’s Aqua Line will have nine metro stations in total out of which two will be in Noida and seven will be in Greater Noida. The metro stations in Noida include sectors 122 and 123 and the metro stations in Greater Noida include sector 4, Ecotech 12, sectors 2, 3, 10, 12 and Knowledge Park V.
GNIDA CEO Narendra Bhooshan was quoted in the report saying that as the area was getting more and more populated by the day and needed a stable transport network, they had to start work on the metro project. For phase-wise construction of the route, GNIDA will make a proposal. Recently, a survey was conducted which suggested that work can be started on metro stations till sector 2 in Greater Noida. Bhooshan said that the Greater Noida Authority is ready to spend their Rs 250 crore share. He also said that he would write to his Noida counterpart and would request him to contribute as well. According to the initial DPR, the extension project is scheduled to take two years for completion, however, Bhooshan added that he would request Noida Metro Rail Corporation (NMRC) to expedite it. The 29.7 km long corridor of Aqua Line, which is likely to be thrown open to the public by this year-end, will run from Greater Noida’s Theta to Noida’s Sector 71. 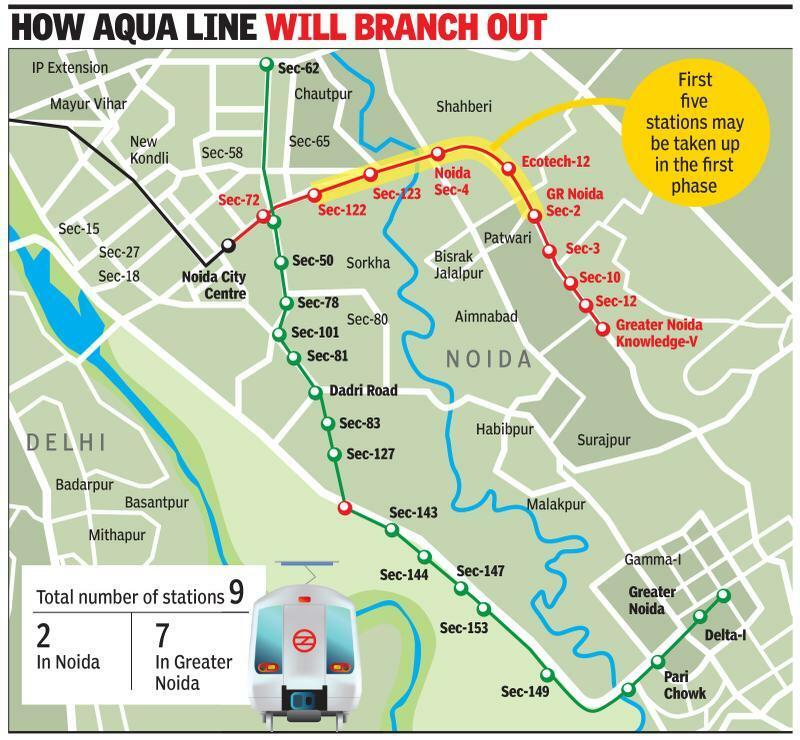 Recently, it was reported that the metro fares for Aqua Line service will be lower than those in the Delhi Metro as it will depend on the number of stations traversed, similar to that of Lucknow Metro.